September 8, 2014 By Allyson 5 Comments This post may contain affiliate links. Read my disclosure policy. So, if you follow this blog, there are probably 2 things you know about me…1. I am a vegetarian, and 2. I love buffalo sauce. 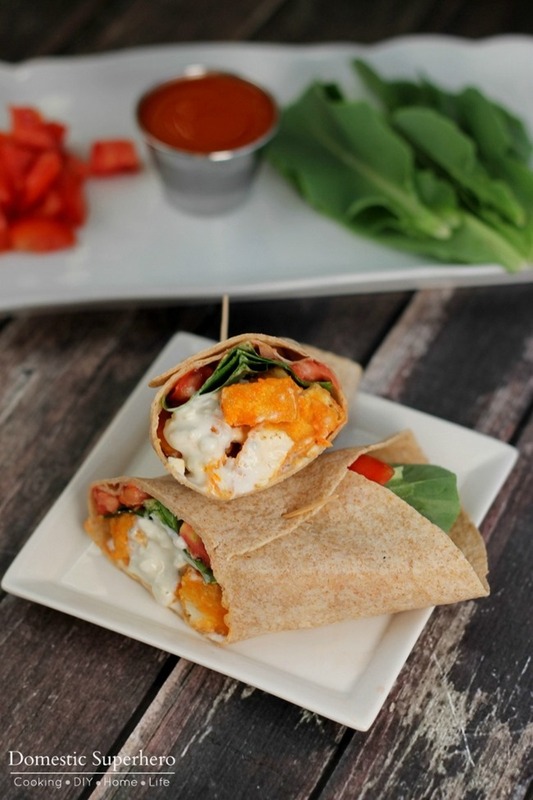 Back in the day, before I was a veggie (nickname given by 2 ultra-creative teenagers), I used to eat buffalo chicken wraps all the time…and when I say all the time, I mean it…it was pretty much the only thing I ever ordered when dining out. So, when I decided to become a vegetarian, I am a little nervous about not being able to have my buffalo chicken anymore. It didn’t take long to realize, though, that you can put buffalo sauce on anything. Anything. I’ve experimented with so many different ‘buffalo’ recipes….Buffalo Quinoa, Buffalo Bleu Cheese Fries, Cheesy Buffalo Baked Potatoes…and the list goes on. Buffalo sauce is awesome. 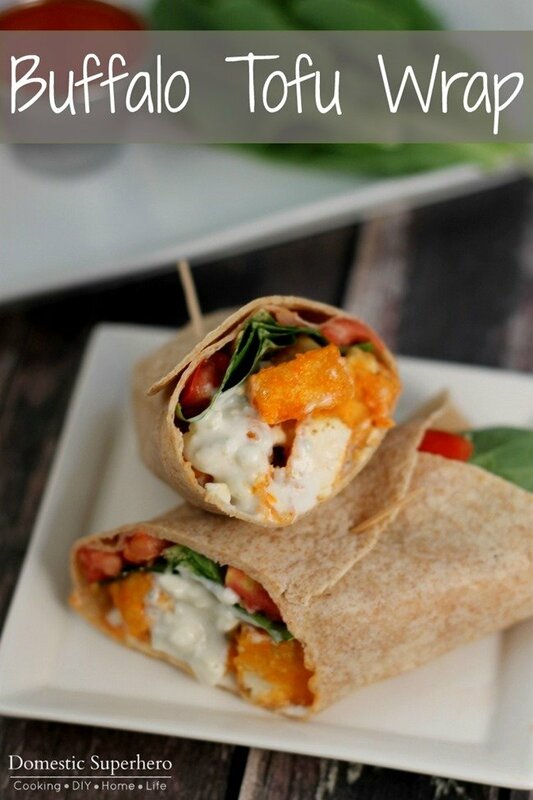 However, I had never really found a replacement for my buffalo chicken wrap, until now. 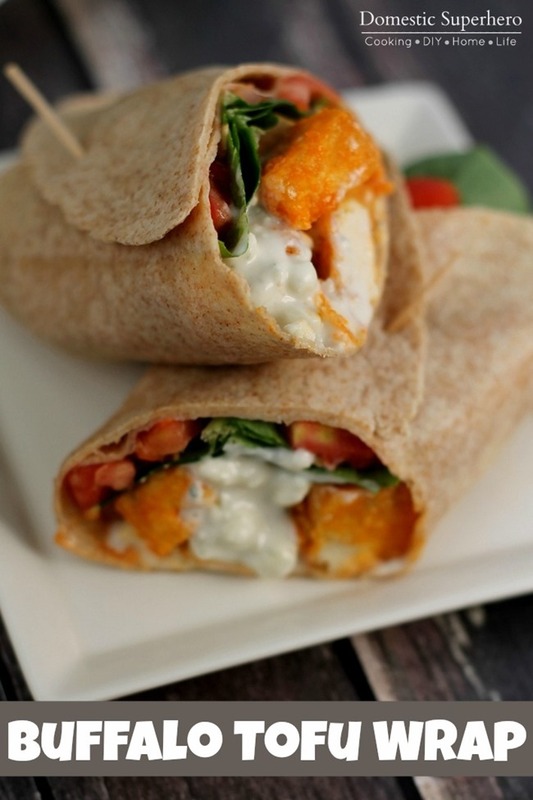 I am not sure why I didn’t think of this before, because when I did finally think of it a few weeks ago, it was a major ‘ah-ha’ moment (as my girl, Oprah would say)….Buffalo Tofu wraps. This would be the answer to all my buffalo prayers. 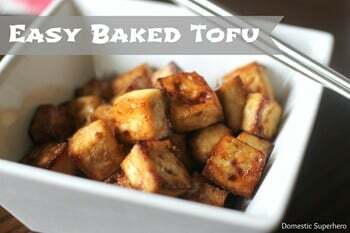 Now, I may have lost some of y’all at ‘tofu’, but trust me, this is NOT your typical tofu recipe. 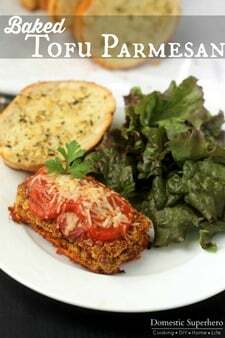 My husband thought I was feeding him chicken when I made this, because it is SO similar. It’s really all about the texture (like crunchy fried chicken bits), and the sauce, and the way this tofu is prepared makes it really seem like chicken. You just want to fry the tofu (I know, super healthy…but neither is fried chicken! ), until it gets good and crispy. It doesn’t take long, about 5 minutes, and it is so tasty. I used fresh lettuce and tomatoes from our garden to top the buffalo tofu, and then added blue cheese dressing….so yum. Of course, you can top with whatever you love! 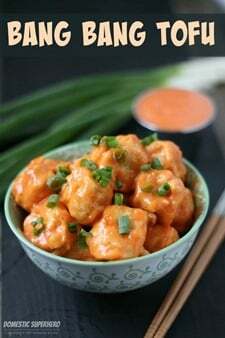 With the frying of the tofu, I wouldn’t eat this everyday (well, I would, but my body wouldn’t like me very much), but it is definitely awesome when you want to get your buffalo ‘chicken’ fix in. 1. Drain your tofu, then press out the water by placing the block of tofu between 2 clean towels, and then putting a heavy object on top of the top towel to press it down. This will drain all the water out. Leave for at least 20 minutes. 2. After you drain the tofu, cut it into bite size cubes. Place the cornstarch into a large ziplock bag. 3. Place half of the tofu cubes in the bag, close, and then shake around to coat the tofu with the cornstarch. Heat the vegetable oil in a tall sided stock-pot (or a pot good for frying), on medium heat. Once the oil ripples (about 1-2 minutes), remove the tofu from bag one by one, and drop carefully into the oil. Fry for about 4-5 minutes or until lightly browned, and then flip over in the oil and cook for another 3-4 minutes on that side. 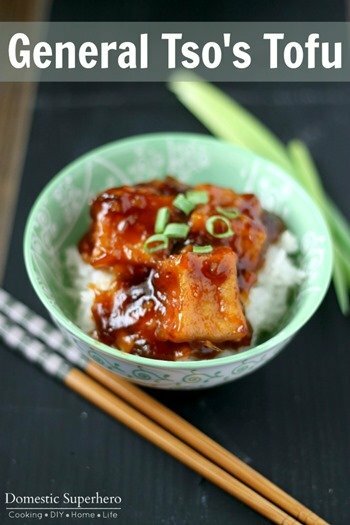 Remove tofu from pot, and set on paper towels. 4. Repeat step 3 with remaining cubes (except you don't need to heat or replace the oil since it's already heated and in the pot). 5. 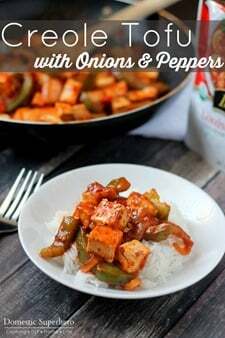 Place tofu in a medium bowl, add buffalo sauce and then toss to coat. 6. Stack the tortillas one on top of the other and then loosely wrap a damp paper towel around them. Microwave for 20 seconds to heat them up. 7. 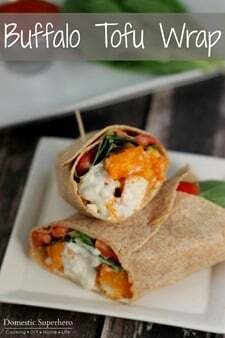 To assemble the wraps, place one wrap on a plate, then add 1/4th of the blue cheese crumbles or dressing to the center of the wrap, add 1/4th of the tofu cubes, a couple pieces of lettuce, and then 1/4th of the sliced tomatoes. Then wrap and secure with a toothpick so it doesn't open. 8. Repeat step 7 for remaining 3 wraps. 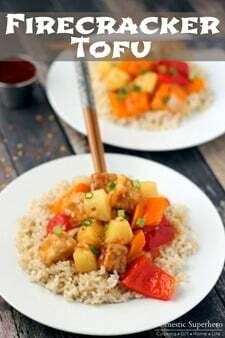 * You could also make these with baked tofu if you prefer not to fry. I hope you like them as much as we do! I pretty much look for any excuse to use buffalo sauce. I love making the tofu (same way in this recipe), and then putting it over a salad for a buffalo tofu salad…so yum!